Thank you to my year 9s for injecting a bit of fun at the start of today’s lesson AND giving me a huge nudge to blog. It’s been a month since the last post! A few weeks ago, I introduced the archetypal learning spaces (Bianca Hewes makes an appearance here yet again as a source of inspiration). Since then, we used campfire, waterhole and cave on a regular basis. To my surprise today, my year 9s decided to voluntarily form a campfire because apparently, “it’s tradition” and “it’s fun”…like, checking in with each other (not quite the definition, I know, but still….). 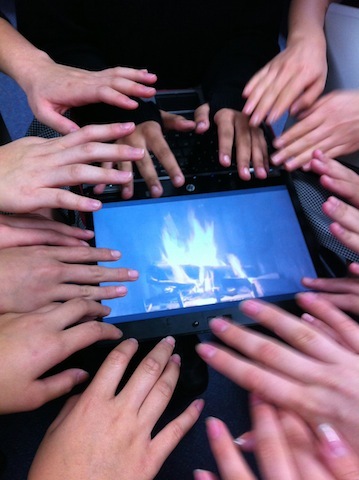 Also, one of the students used her tablet to display a roaring fire. We soon realised that this was indeed fun and a photo opportunity…..smartphones galore…mine included. This class is shaping up to be a real community of learners, happy to be in the classroom and almost reluctant to leave even for recess or lunch. Go figure! They have become comfortable with the self-directed approach and regarding each other as resources for learning AND me as NOT a font of all knowledge…more like the font of questions! Subsequent iterations of Medals and Missions (mentioned in this post, Making Progress) are better with me being less austere with the medals (haha). I don’t even have to prompt them to do their missions…they just get done. No deep post here; rather, a celebration. A good reminder that sometimes, things work and when they do, life’s good. 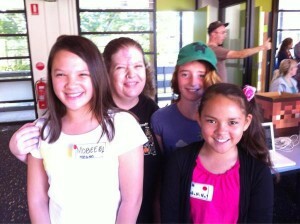 Today, my daughter (Megan, 10) and I went to a MassivelyMinecraft l33tMeet. Megan went to be with her MassivelyMinecraft mates IRL and I went to learn more about games-based learning (GBL), as a parent trying to understand the appeal of MassivelyMinecraft and as an educator to check out GBL and gamification everyone seems to be talking about lately….and yes, I’m totally a n00b, but I’m learning to play. Bron Stuckey talked about MM as a research into learning in the 3rd space, learning outside of school. It is a space where kids are leading kids and learn about digital citizenship by being digital citizens. Adults are there (@jokay*, @vormamim, @bronst) to guide but not to dictate. There is no curriculum but there are badges kids can aim to earn so they can level up, if they want to. I won’t go into the details about MM here as if you’re interested, you’re really better off visiting the MM site. What really struck me was what Bron called the small g and the big G. The small g is what kids learn in-game, e.g. building houses, fighting creepers, crafting potions. The big G is what kids learn through the game using MM as a framework, e.g. writing journals, making video tutorials, skyping (text and voice), screencasting, self-directed quests. The big G provides opportunities (heaps) to develop individuals and a community where kids lead kids and kids are comfortable to learn and I know that from Megan’s experience, that the learning is massive! ISTE’s NETS for students are met in MM. Bron briefly talked about Quest Atlantis. She said that educators can find the jump to no curriculum (MM) too big a leap which is why QA can be appealing. In QA, kids complete educational tasks through quests and missions. Dean reckons all these is transferrable into other contexts – different virtual worlds (Second Life, OpenSim, etc) and books/texts (Lord of the Flies, Animal Farm, etc). Set up the big G and kids will learn. I can begin to see that it is possible, thanks to the l33tMeet. I can begin to appreciate that teachers are (can be? should be? ), not so much teachers but, designers for learning. Between you and me, I much prefer to use the terms small g and big G as against gamification and GBL. *Jo didn’t “speak” today. She was busy doing what she does extremely well, “playing” with the kids in-world. **I’m guilty of thinking how can I tick all the boxes in the curriculum with nary a thought that maybe the boxes are not enough; kids can do more. 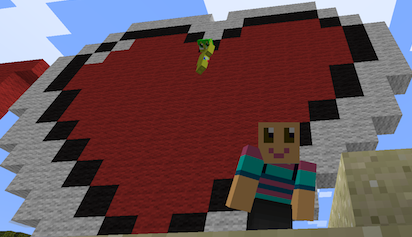 Today I joined Massively Minecraft, “a learning community exploring how to live, work and play in Minecraft“. I’ve posted before how this world is where my younger daughter, Megan has developed her ‘voice’ (see Of Hopes and Dreams). I watched her play – and learn so much – in the last 3 months; a source of vicarious learning for me. Megan has developed in so many ways but this post is not about her. This post is about me in Ms10’s world. Here she is, watching over me with one of her epic builds as a background. Megan in yellow, hovering over me. In this world, Megan is literally watching over me. It’s hard and there is much to learn but the fun is not just a promise for when I’m good enough. The fun has already started. It’s not just me having fun either. Megan is truly delighted, just as she is delightful. So when people say learning should be fun, it’s not to dismiss the idea of difficulty. Nor is play something you do before you do real work. Play is not just the start nor just the end. …. and I’m learning with and from kids. Some of you may know that I’m participating in the The Sketchbook Project 2012 World Tour and that I’ve even got a companion blog for it, 10minutes. I expected this project to be a creative outlet for me and that is certainly proving to be true. What I find surprising is the number of people who seem to be inspired by it. 10minutes, the blog, is me playing in public. I am not a professional artist and participating in The Sketchbook Project 2012 World Tour is my ticket into ever having my work in an Art Gallery (Brooklyn). It is serendipitous that @gcouros asked me to create a video for the opening of his K-12 Online Conference. You can read the rest of the story in the 10minutes post: Playing in Public – perhaps the most popular post in that blog. What I want to do here is to share the sketch, the video and what I’ve learned from this experience; after all this is my learning blog. Many adults still like to play. in public even. Sharing begets sharing. This video has inspired more videos from dear Twitter friends. Here’s one from my sketchbook buddy @janellewilson, one from @stefras – (you have to read his post) and one from @7MrsJames. Granted the latter 2 were pushed along by @gcouros’ appeal for more sketches as inspired by mine; this included this video from @edusum. Apropos sharing, my Be Amazing post further validates this point. I can be a bit more confident about my creative talents, rusty though they may be. Playing in public invites others to play along, with, or on their own. Playing encourages conversations that may never would have happened otherwise. Maybe it’s because we ‘let our guard down’ when at-play and that helps build friendship. Such a conversation has led me to my next piece of artwork on organ donation. Sense-making is a personal thing. People have told me various things they’ve taken away from this singular playing in public effort. What they make of it is influenced by their own personalities, culture, interest and individuality. Playing means lots of different things. Defining it is difficult because it’s not black-and-white. It’s a spectrum, a colourful one at that. Fun. Challenging. Purposeful. Creative. Destructive (as in, it can be fun to squash sandcastles at the end of the day). Process. Mindset. Context of and for learning. Are you playful? Do you like playing in public? Have you tried to play in public as an adult? What do you regard as play?